Magento Go users still have a few months till their platform discontinue. So, they consider different alternatives of e-Commerce solutions, that will meet the needs of their business. Many of them migrate from Magento Go to Bigcommerce, as it seems to be a good choice, which allows to enjoy fully functional online store. 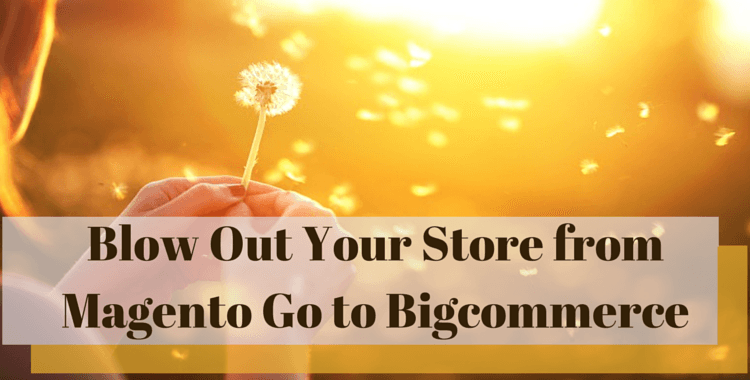 Launched in 2009, Bigcommerce is all in one solution with rich functionality and ease of use. And of course these advantages lead to successful results. “On average a Bigcommerce client generates nearly twice as much revenue as our nearest competitor,” underscores Bigcommerce Chief Product Officer West Stringfellow. But what are the core reasons of such an efficiency? Unique design. Creating an original website is especially easy with Bigcommerce, as it offers over 115 free templates and a simple WYSIWYG editor. It means store owner will be able to see how changes are going to look on the e-store using desktop or mobile device. Easy to use back-end. No matter if you need to add a new product or some description, the process will take no longer than a few minutes. Moreover, in case you want to expand the functionality of the web shop, plenty of extensions are on App Store, which can be installed in one click. Support. 24/7 technical support is available through the phone, email, social media or live chat. So, no matter when you run into issues with the web store, even at 2am in the morning, there is an opportunity to reach support team. In case you prefer to learn by yourself, a lot of video tutorials and instructions can become very helpful. Are you already interested in using this shopping cart? Take a look at infographic, that compares both e-Commerce solutions and highlights the the easiest way of migration from Magento Go to Bigcommerce. Now you know all the needed information about successful data transfer from one shopping cart to another, that takes only a few hours. So,don’t waste your time, register a new Cart2Cart account to switch from Magento Go to Bigcommerce immediately!